Since they first debuted on the market in 2000, Invisalign has become an increasingly popular choice for teens and adults who want to correct dental misalignment and achieve a straighter smile. 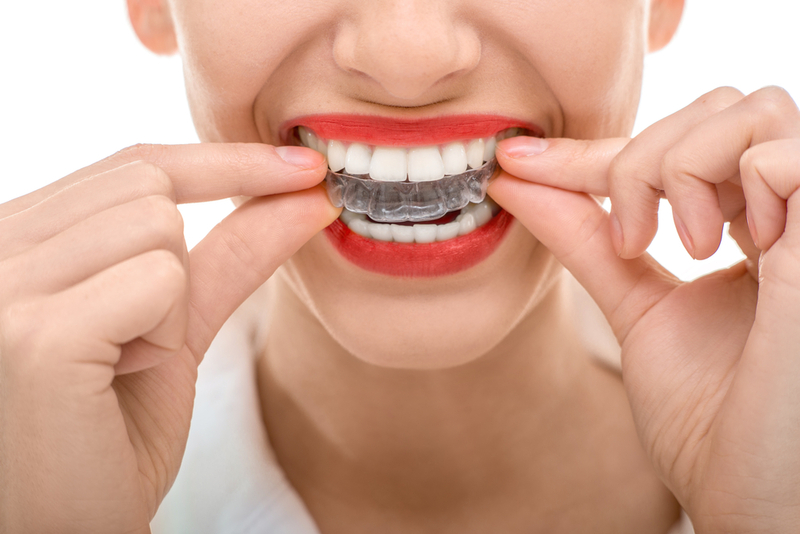 Instead of using metal brackets and wires, Invisalign improves the appearance and health of your teeth using clear plastic aligners that move the teeth into their ideal position. Many people considering Invisalign wonder what they can expect from wearing the aligners on a day-to-day basis and our handy guide is designed to tell you just that! Morning: When you wake up, remove the aligner and clean by giving it a quick rinse and brushing under the tap. Then, brush and floss your teeth as you normally would. When you eat breakfast and drink your coffee, remove the aligners. After you’re done eating, brush your teeth once more and then pop in your aligner tray. During the day: Try to avoid sipping on sodas, tea, coffee, or any beverages other than water throughout the day. Don’t chew gum with the trays and always remove the trays during meals. After you eat, brush your teeth before putting the aligners back in. You don’t want stray food particles trapped in your teeth since this can increase your risk of tooth decay, gingivitis, and bad breath. Before bed: Clean your aligners again and floss and brush your teeth thoroughly before wearing the aligner for the night. You may want to take this opportunity to soak your tray in the specialized cleaning crystals offered by Invisalign. Most of our patients are surprised at how little Invisalign impacts their daily routine. In fact, many experience an improvement in their oral health since they tend to pay more attention to brushing, flossing, and keeping their teeth clean while wearing the trays.